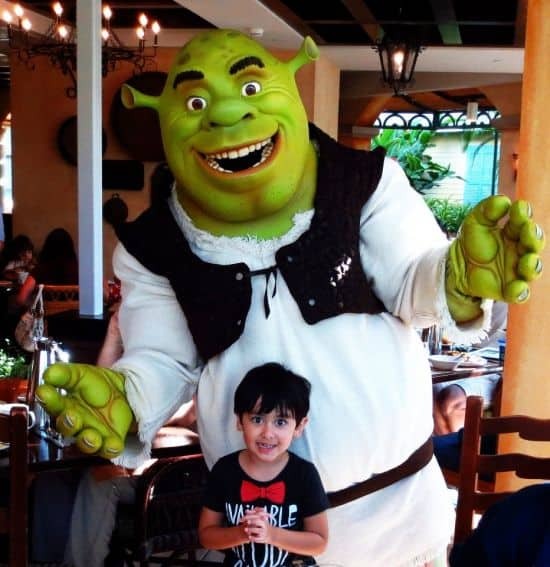 My son is Shrek’s #1 fan. He is such a fan, that this year, instead of giving thanks around the Thanksgiving table, we opted to book a three-night stay at Gaylord Palms in Kissimmee, Florida. We wanted to thank Shrek personally for all the joy he’s brought to our family over the past 5 years. We decided we would celebrate the holidays with our favorite DreamWorks Animation in person. Open to the public, the ShrekFeast at Gaylord Palms is an unforgettable treat for the whole family! At this very special breakfast, we became honorary Ogres and got up close and personal with Shrek, Fiona, and Puss in Boots. 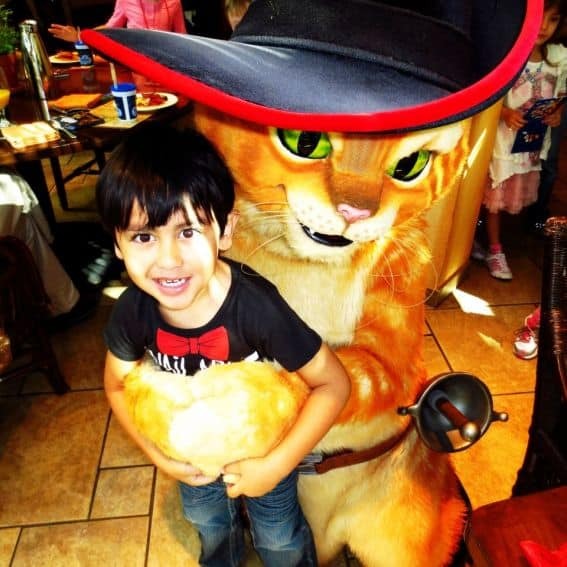 Watching my child’s face light up as he hugged his favorite movie characters made this meal more than worth its price tag ($29.95 adult, $19.95 child). Our ShrekFeast included a wide variety of traditional breakfast foods alongside a fountain flowing with green chocolate, a green breakfast potion to drink, and Shrek-shaped waffles with syrup. Armed with candy and frosting, families are seated at a table in Gingy’s house, a life-sized gingerbread house, for gingerbread decorating. 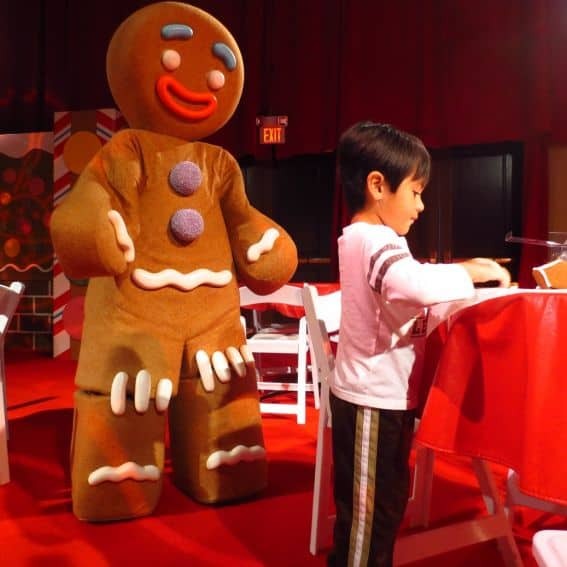 Under the direct tutelage of Gingy, children can decorate one of several gingerbread kits available for purchase. This heartwarming activity includes hugs, photo ops, and lots of playful exchange. Our Gingerbread Tree Ornament Kit cost just $14.95, but the joy this activity brought to our family, and the heartwarming photographs that I now find myself treasuring, made it priceless. Parents are welcomed to take pictures with their own cameras. (1) Bathe the kids, (2) put on pajamas, and (3) go to the show. Say what? At Gaylord Palms, every night over the holiday season ends with two hours of live holiday entertainment. Enjoy a festive Luminescence Christmas Show (lights timed to music) from the comfort of your balcony. There are many room options at Gaylord Palms, but a room with a balcony facing the atrium ensures that regardless of the kid’s bedtimes, mom and dad can still catch the show with a nightcap. Check out the video I shot from my balcony! At ICE!, families are invited to watch a tribute to the DreamWorks Holiday Classic, Frosty the Snowman. Afterwards, cold weather jackets are provided for you to wear while you walk around and view DreamWorks characters hand-carved out of 2 million pounds of ice in a hall kept at just 9-degrees! 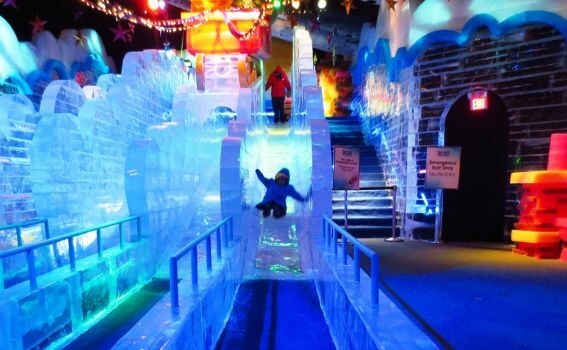 At the end of the self-led tour, four glorious two-story ice slides await! I was only able to stay in the hall for 10-minutes before I had to run out to escape the cold. In fact, I scooped up my kid and ran out of the hall so fast that my son’s beanie fell off, but I was too cold to go back and get it! Later that night a hotel employee brought my son’s hat up to my room. A word of warning, don’t show up in flip-flops (like I did). Next time, I would pack a beanie, scarf, gloves, and ear muffs. Yes, I’m suggesting you bring ear muffs to Florida! 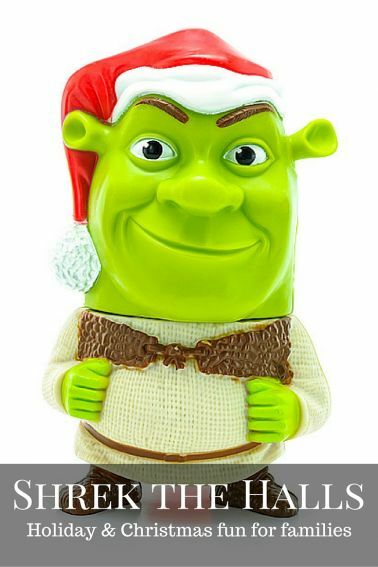 Florida is the perfect destination for Shrek lovers because Universal Studios offers generous portions of Shrek-rich activities for the young and the young of heart. In addition to all of Gaylord Palm’s Shrektacular activities, nearby Universal Studios features a Shrek 4-D movie. For those who’ve never been, Universal Studios Florida and Universal’s Islands of Adventure are adjacent theme parks with shared parking facilities. Both are excellent outings for children of all ages, but only Universal Studios features Shrek, SpongeBob Square Pants, and Despicable Me. 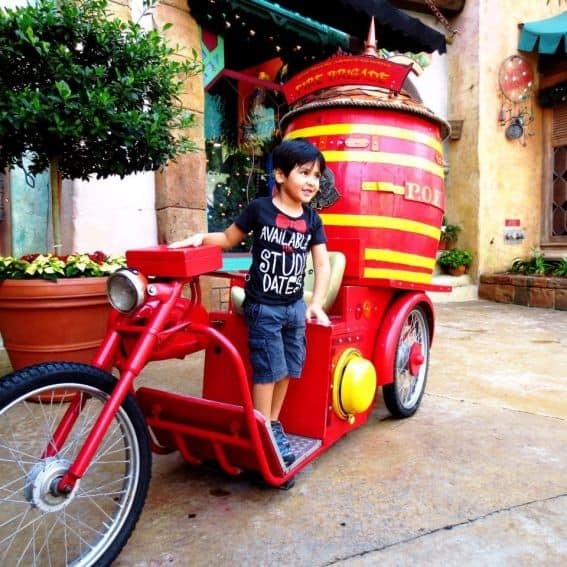 At nearby Islands of Adventure, your children will enjoy fantastic rides and fantasy lands such as The Amazing Adventures of Spider-Man, the whimsical world of The Cat in the Hat, and the Wizarding World of Harry Potter, just to name a few. Before visiting Marriott’s Gaylord Palms, my family resided at another Marriott property, Courtyard Orlando Lake Buena Vista in the Marriott Village. Marriott Lake Buena Vista offers loads of complimentary family oriented amenities, is conveniently located near outlet shopping, and Universal Studios is a mere 15-minutes away. SeaWorld Orlando is less than 5 miles away! Have you been to Universal Studios Florida? Leave a review! Disclosure: I received a discounted rate for my hotel stay at Gaylord Palms and complimentary tickets to Universal Orlando and Islands of Adventure. The Courtyard Orlando Lake Buena Vista in the Marriott Village also provided complimentary lodging. As always, the opinions expressed are my own.